Dag Kittlaus and Adam Cheyer, co-founders of Siri, the virtual assistant now built into all of Apple's iOS devices, are set to demonstrate their newest artificial intelligence project on Monday, reports The Washington Post. Viv, the name of the AI bot, is more advanced than Siri and is able to carry out complex tasks by mimicking the "spontaneity and knowledge base" of a human assistant. Viv can, for example, set up a dinner reservation and purchase movie tickets all based on one query, parsing ticket prices to find deals and offering suggestions if a movie is sold out or a restaurant has no seating available. Completing the same task with Siri would require multiple commands and human interaction. In an example given by The Washington Post, the Viv team uses it to order pizzas from a nearby restaurant, with Viv parsing numerous voice-based topping and side dish orders without ever needing to open an app. Much of Viv's functionality is enabled through integration with third-party apps like Uber, Florist One, SeatGuru, ZocDoc, and Grubhub, similar to Amazon's Alexa. The team behind Viv is in talks to bring on more partners and plans bring the Viv technology to a variety of Internet-connected devices like cars and TVs. Grubhub chief executive Matt Maloney said he rushed to sign up with Viv two years ago, impressed with the idea of allowing consumers to perform different activities without having to toggle between services. "No one has been able to say, 'I want the movie ticket, and the bottle of wine, and some flowers on the side' -- all in one breath," he said. The goal with Viv, according to Kittlaus, is to offer a way for humans to interact naturally with services through complex human-to-human style conversations, a project Kittlaus and Cheyer have been pursuing since before the development of Siri. Siri was built around the same premise, but underwent changes under Apple's leadership. "Steve [Jobs] had some ideas about the first version, and it wasn't necessarily aligned with all the things that we were doing," Kittlaus told The Washington Post. Google and Facebook have already made offers to purchase Viv, but it is not clear if Kittlaus and Cheyer have plans to sell the technology. 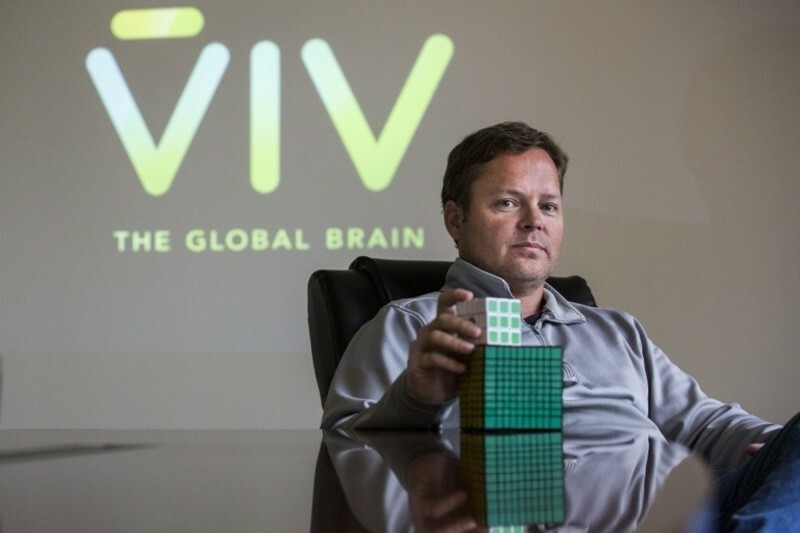 The Viv Labs team wants to see the technology built into a wide range of devices, and Kittlaus says the company will "pick the path that gets us there." Viv, tell Siri to show me movie listings. Siri: I'm sorry, I didn't get that. Siri: the nearest mine is 5038 kilometers from your current location. Hey guys... We got Apple to buy us once. Now that Apple isn't spending any money on Siri, let's split off and invent another AI, make it a bit smarter, and then sell it back to Apple again and make a crapton more money! If they want a company to work with they should stay away from Apple. Too many internal politics and it will get shoved in the conner somewhere and never see the light of day. Apple ruined the Siri name. Under Apple, Siri became a joke. Which it is. My take is the name comes from Antonio Vivaldi, a baroque composer who was known for his complex and compounded works. It is appropriate. Voice recognition using a relational database with multiple associative weighed vendors creating a single response based on compounded queries. Not bad work boys! Just anorher strategy to sell a "new" product. The viv-boys are just doing their job: Spelling ill of a sold predecessor is part of profit maximation. It's that simple. I found really unsexy haters of Siri here, maybe related to that campain. Personally, I think Siri does her job quite well. I do not know one single person here in the real world around me, that hates Siri. We are living in a competive world. But spitting across the street is beyond cultivated colloquial. It's that easy.